I used to think that coffee was coffee, right? Wrong… There are so many ways to make a cup of coffee. Where I can’t stand instant coffee, I do love cafetiere coffee. I have a couple now and again at work in the afternoon to wake myself up a bit. This is mainly because my cafetiere holds two mugs, and there are some pretty boring meetings in my office. After my big packed lunch I often need all the help I can get to stay awake. This Cacao Superior Columbia by Taylors of Harrogate should help. 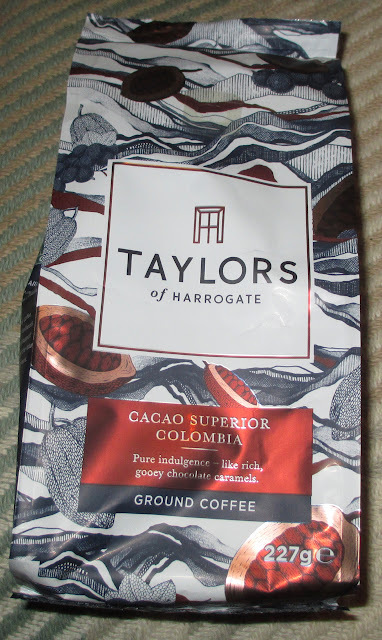 Highly accredited by HRH the Prince of Wales; Taylors have the rainforest Alliance Certification, which helps to protect the local farming landscape and the environment in general, whilst ensuring sustainable livelihoods, as well as supporting local communities. This Cacao Superior Columbia is sported on the packet as tasting of “rich gooey chocolate, deep cocoa and roasted brown sugar, with floral high notes, and a burst of blackcurrant and apple”, “Surely not?” I hear you ask… Well, there’s only one way to find out… Measuring spoon in one hand and ‘two-mug’ cafetiere in the other, I headed towards the trusty work kitchen kettle. On measuring out a decent wodge of ground coffee into my cafetiere I was pretty taken aback by how strong the coffee smelt. Yes there were hints of dark chocolate and also a little dark fruitiness in the aroma. I was more than a little apprehensive though, whereas I like my ales bitter I prefer my coffee smooth. This ground coffee smelt like you could remove paint with it. Having said that, when poured over milk in my work mug this coffee smelt like a dark brown sea of tranquillity. I couldn’t tell you that it smelt like chocolate or fruit once brewed and sitting on my desk next to me. It just smelt like a really good mug of coffee. On taste there was sweetness to start with (no, I didn’t add sugar), but there was depth to this flavoursome coffee. The subtle sweet taste moulded into something akin to dark chocolate and coffee. As my tastebuds plunged deeper into the depths of my coffee session, there was a fruitiness similar to dark fruits such as blackcurrant mixed with the chocolate and mainly coffee and perhaps comparable to a little toffee apple into the aftertaste, all with a heavy dose of coffee on top of course, but hey… I’m no coffee connoisseur, but I did enjoy both mugs. I’m just a guy trying to stay awake at work! 227g of ground coffee. Ingredients include; 100% Arabica coffee.